What Is The Secret Message on Poe's Vest in Star Wars: The Force Awakens? By now, many Star Wars fans have already seen Star Wars: The Force Awakens multiple times, as the box office blockbuster is nearing a whopping $900 million domestic, adding to its record-breaking tally. Many are watching the film over and over again to try and decipher some of the Easter Eggs that director J.J. Abrams left behind for fans to discover. And now it seems another Easter Egg mystery has been solved. Tumblr user You Need a Pilot has deciphered a small message shown on Poe Dameron's (Oscar Isaac) flight vest, that is actually quite humorous. 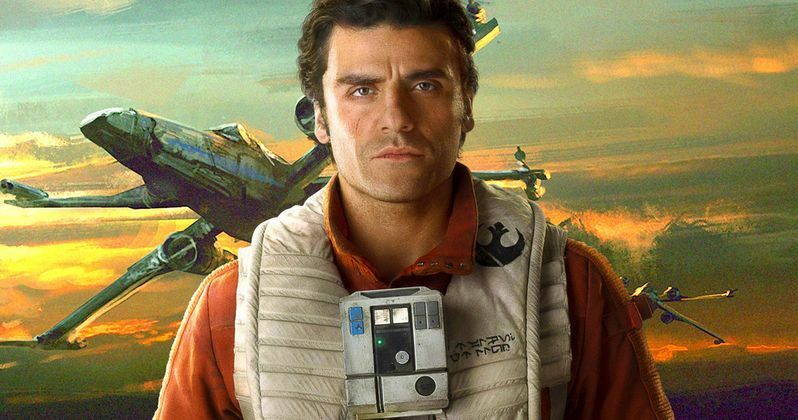 In the above photo, you'll notice that, below the Resistance logo on Poe Dameron's vest is a tiny message, which many fans recognized as the fictional language of "Aurebesh," the most common written language in the Star Wars galaxy. This fan was considerably stumped by the message since, although it appeared to be in Aurebesh, the letters didn't exactly match up. This Tumblr user eventually realized that the message is actually upside down and backwards, so it can be viewed by the pilot when looking down at the vest. As it turns out, there is a good reason why this message is printed like this, since it translates to "Pull to Inflate." This means that Poe's vest, and the other vests worn by Resistance pilots, are actually inflatable life vests, presumably in case of a crash landing into water. It certainly leads one to wonder how many other humorous hidden messages are still left to be deciphered in Star Wars: The Force Awakens, but thankfully, we'll be able to do this sort of deciphering detective work from our own homes soon. We reported last week that Disney and LucasFilm have set an April 5 Blu-ray release date, and it is already available for pre-order on Blu-ray, DVD and VOD. Unfortunately, the studios haven't announced any special features details yet, so perhaps there may be some bonus material that actually deciphers some of these messages for the fans. It's also worth noting that the pre-order sites list the Star Wars: The Force Awakens runtime at 150 minutes, which is 14 minutes longer than the theatrical cut of 136 minutes. It's possible that these 14 minutes are the deleted scenes from the theatrical cut. Regardless, while we wait for the Blu-ray release of Star Wars: The Force Awakens, take a look at the photo that showcases You Need a Pilot's deciphering skills in action, along with the actual photo. Are there any other hidden messages that you've noticed in Star Wars: The Force Awakens? Let us know what you think, and stay tuned for more on this epic blockbuster.